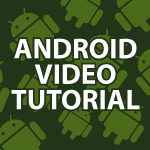 Here I will organize all of my Android Video Tutorials as I make them. I’ll include the playlist for all the videos at the top. You will also be able to search for the exact video you are looking for, because I’ll include a link to all videos along with a short description on what is covered. My Android Video Tutorial is not finished and I plan to make many more videos. I just wanted to make this to help people find exactly what they need more easily. Feel free to leave requests for what you’d like to see in future Android tutorials below. Install Android Development Tools : I cover how to install Googles ADT plugin, all of the common errors people get and take you through running your first app. Solving Android SDK Problems : I show you how to solve many of the Android SDK Problems sent me. We’ll look at: How to speed up the emulator. Solve the problem in which the Android SDK Manager could not find packages. Solve the Android SDK parse error problems. Solve the issue in which the emulator doesn’t execute your program. In this first part of my Android Development Tutorial I’m going to describe almost every file and folder used to develop an Android app. I’ll walk through every single file and explain how it is used. I’ll explain the whole file system. We’ll also make an app and as I create it, I’ll explain every single step and what everything means. Android Development Tutorial Pt 2 : We’ll cover the lifecycle of an Android activity completely. We’ll then look at how to make an app support many languages. We’ll look at how to grab string resources and how to pull them into java and xml files. Finally, we’ll look at the AndroidManifest.xml file in detail. Android Development Tutorial Pt 3 : I cover how to do numerous things: How to use the Android Visual Layout Editor, How to edit the GUI layout by editing the XML, How to use TextView, EditText and the SeekBar, How to catch events, How to save the apps state with onSaveInstanceState(), How to get values from components and how to change the values. Android Development Tutorial Pt 4 : Over the course of this tutorial and the next I will cover RadioButtons, RadioGroups, CheckBoxes, DropDows (Spinners), Buttons, Chronometers, ChangeListeners, ItemSelectedListeners, onClickListeners and much more. Android Development Tutorial Pt 5 : I will cover how to both get values from and change values in Android components.I also cover how to use changeListener, OnCheckedChangeListener, setOnCheckedChangeListener, OnItemSelectedListener, setOnItemSelectedListener, onItemSelected, setOnClickListener, and also how to turn a chronometer into a stop watch. Android Development Tutorial Pt 9 : I focus on using the Android XmlPullParser for parsing an xml file. I’ll be getting data from the Yahoo Web Service just like last time. Google recommends the XmlPullParser over all others because it is fast, requires the least amount of memory and helps maintain battery life. SQLite3 Tutorial for Android : I cover how to do most anything you’ll ever need in regards to SQLite in these tutorials. It continues with SQLite3 part 2, part 3 and part 4. Android Development Tutorial Pt 10 : I will show you how to create an Address Book / Contact App using both Android and SQLite. I’ll go through how to define constants for my interface in the string.xml and dimens.xml files. I’ll then create the activity_main.xml file which will be the opening interface. I’ll also introduce the ListView. Android Development Tutorial Pt 11 : I go through every query I will be issuing to my SQLite database in the app. I show how to create tables, insert contacts, update contacts, delete contacts, output everything and even drop the table. Android Development Tutorial Pt 12 : I cover a ton of topics: How to Create a SQLite Database and Tables, How to Issue Queries, How to Insert Data, How to Update Data, How to Delete Data, SQLiteOpenHelper, execSQL, SQLiteDatabase, ContentValues, rawQuery, Cursor, and more. Android Development Tutorial Pt 13 : I continue making my Android Address Book App. I will create the Java that will power the ListView for the Main Activity and I’ll also cover the New Contact code needed to add a contact to the database. Android Development Tutorial Pt 14 : In this part of the tutorial I will completely finish the Android Address Book App. I will also spend a lot of time answering questions I recently received on Contexts, Intents, how to pass data between Activities using putExtra() and and getStringExtra(). I’ll also cover how to import Android packages into Eclipse. I will show you how to create an Android JSON Parser. I have received this request numerous times and I will show the easiest way to parse JSON with Android without all of the extra code that confuses people. I will be grabbing the JSON data from the URL provided by the Yahoo YQL Console. Android Development Tutorial 16 : There has been a ton of demand for an Android fragments tutorial, so I wanted to try and do it right. It is very easy to get confused by fragments if they aren’t presented in the right way. I did my best to cover a lot in this video and most importantly to keep it simple. Android Development Tutorial 17 : Fragments are often used so you can create completely different interfaces depending upon the screen real estate available. We’ll cover how to do that and we’ll also look at how we can get the fragments to communicate with each other and the main activity. Android Development Tutorial 18 : This tutorial covers how to create custom icons for our app. We then build an app based around the use of fragments. We will be building an app that a Census taker would use to gather information on people. Android Development Tutorial 19 : I will be answering a bunch of common questions I receive. I’ll be covering how to have your app automatically change into another language ( Localization ). I’ll also show how to catch multiple events. We’ll also go over how to create a layout specific to when the app is in landscape mode. Android Development Tutorial 20 : I will continue talking about Fragments. We will also cover how to use CheckBoxs and OnCheckChangedListener. Will explore how to generate unique IDs for all our contacts using UUID. Will create a Singleton that will hold all our contacts in an ArrayList and more. Android Development Tutorial 21 : I cover the following : FragmentManager, Creating list items for a ListView, ListFragment, Android Adapters, ArrayAdapter, Generating items from an ArrayList for a ListView and more. Android Development Tutorial 22 : I will connect the ListFragment to the Census App, so that when you click on an item we’ll be able update the Contacts. All the Contacts are updated and we also cover how to store and pass contact IDs between activities. We also streamline the code by separating duplicate code out into another class and much more. Android Development Tutorial 23 : I will cover how to use the Android ViewPager. The ViewPager allows you to flip through Fragments sort of like you would do with a book. I’ll also cover how to connect the ViewPager with a FragmentManager so that we’ll be able to properly display and track the Fragments and make sure they are updated. Android Development Tutorial 24 : I will cover how to use Android Dialog Boxes. We’ll cover how to design their layouts, how to call for them to open and how to send data from dialog boxes to other fragments and activities using putSerializable and getSerializableExtra. Because I’ll be working specifically with birth dates we’ll also take a look at the Date, Calendar and GregorianCalendar. Android Development Tutorial 25 : I introduce how to work with an outside SDK being the Samsung Mobile SDK in this situation. Over the course of these tutorials I will teach how to use this SDK specifically, but I’ll also cover how to do many things that will apply to Android Development in general. Inkscape Video Tutorial : If we are going to create interfaces for Android apps, we’ll need a tool to create them. Inkscape is the perfect tool for drawing them. In this tutorial I cover what all of the buttons do and I teach you how I remember all of the shortcut key codes. Inkscape Video Tutorial 2 : This time I cover how to: Create Keyboard Shortcuts, Document Properties, Tricks for Selecting Objects, Guides, Rulers, Align, Transform, Rows & Columns and more. Inkscape Video Tutorial 3 : In this tutorial I will cover how to use : the Pathfinder Tools, RGB, HSL, CMYK, Blur, Fill, Stroke, Dropper Tool, the Tweak Tool, Dashes, Joints, Gradient Tool, Gradient Options and much more. I packed a ton of information into this one video. Android Development Tutorial 26 : I show how to install the new Android Development Tools and the Samsung Mobile SDK on both Windows and OS X.